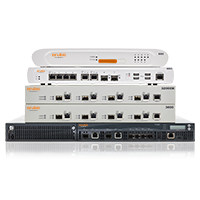 Aruba Networks is the leading provider of next-generation network access solutions for mobile enterprise networks. Mobile Virtual Enterprise (MOVE) architecture unifies wired and wireless infrastructures into one seamless network access solution – for traveling business professionals, remote workers, corporate headquarters employees and guests. With Aruba, access privileges are linked to a user’s identity. That means your enterprise workforce has consistent, secure access to network resources based on who they are – no matter where they are, what devices they use or how they connect. This eliminates the cost and complexity of managing separate wired and wireless access policies. 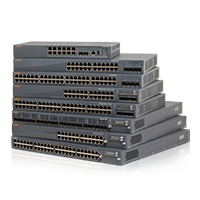 In fact, with Aruba you’ll need fewer ports and consequently less equipment in the wiring closet – effectively rightsizing your access infrastructure. All this makes the Aruba MOVE architecture ideal for bring your- own device (BYOD) initiatives. Aruba embraces BYOD by giving corporate IT mobile device access control. This is achieved by adding device intelligence – called device fingerprinting – to the corporate Wi-Fi network. With Aruba MOVE, personal mobile devices can connect securely to the network in accordance with corporate policies. Running ArubaOS™, Mobility Controllers eliminate multiple IT touch points by centralizing network engineering, IP services and policy controls across wired and wireless, while simplifying the integration of network security and enterprise app platforms. Managed in the cloud, controllerless Aruba Instant APs combine enterprise-class performance and reliability with simplicity and affordability. Just power-up one Instant AP, configure it over the air, and plug in the other Instant APs – it’s that simple. Mobility Access Switches are a new class of product that brings context-aware access to wired networks. Designed for wiring closets and branch offices, Mobility Access Switches deliver secure access to users, independent of their location, access method, device or application. 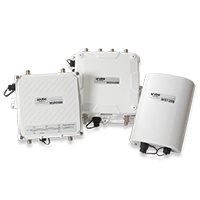 Wireless LAN mesh routers deliver high-performance networking to the great outdoors where wired connections are impractical or unavailable. A multi-radio, multi-frequency design offers superb speed and reliability for Wi-Fi clients and voice, video and data backhaul. Easier to install than your home Wi-Fi network, Aruba RAPs provide a secure, always-on wired and wireless LAN connection back to the corporate network. Ideal for branch and home offices, RAPs also provide policy-based traffic forwarding, role-based security, and USB 3G/4G uplinks. Virtual Intranet Access (VIA) client software is a VPN with a brain. It provides secure network connectivity for mobile devices. But unlike legacy VPNs, VIA automatically chooses the best connection and configures mobile device settings to ensure a most excellent user experience. AirWave is the only multivendor management system with the end-to-end visibility and control to improve network operations and manage RF security. Taking a user-centric approach, it features location and mapping, real-time monitoring, proactive alerts, and historical reports. Aruba Central is a cloud-based software-as-a-service subscription that simplifies the management of Aruba Instant WLANs. It offers remote monitoring and troubleshooting, centralized configuration and firmware management, compliance reporting, and zero-touch provisioning. From just one platform, the Aruba ClearPass Access Management System™ has all your access security requirements covered. It integrates ultra-scalable AAA with policy management, guest network access, device onboarding, device health checks, and a self-service web portal. Meridian-powered custom and consumer mobile apps leverage location-over-Wi-Fi information to deliver indoor GPS services to casinos, hospitals and large public venues. Retailers and resort hotels can use Meridian to engage consumers with targeted location-based messaging.